This laugh-out-loud musical tells the timeless story of Princeton, a recent college grad who moves into a shabby New York apartment on Avenue Q. He soon discovers that this is not your ordinary neighborhood. Princeton and his new-found friends struggle to find jobs, dates and their ever-elusive purpose in life. 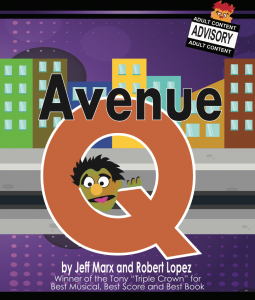 While addressing humorous adult issues, Avenue Q is similar to a beloved children’s show; a place where puppets are friends, monsters are good, and life lessons are learned. Adult content for mature audiences!